Hello flog, one last time! Today marks the end of my three weeks here on Team Echinacea, and I’m certainly sad to say goodbye! Nevertheless, it was exciting and rewarding to culminate this externship with a week of data analysis, poster creation, and presentation of findings to the team. 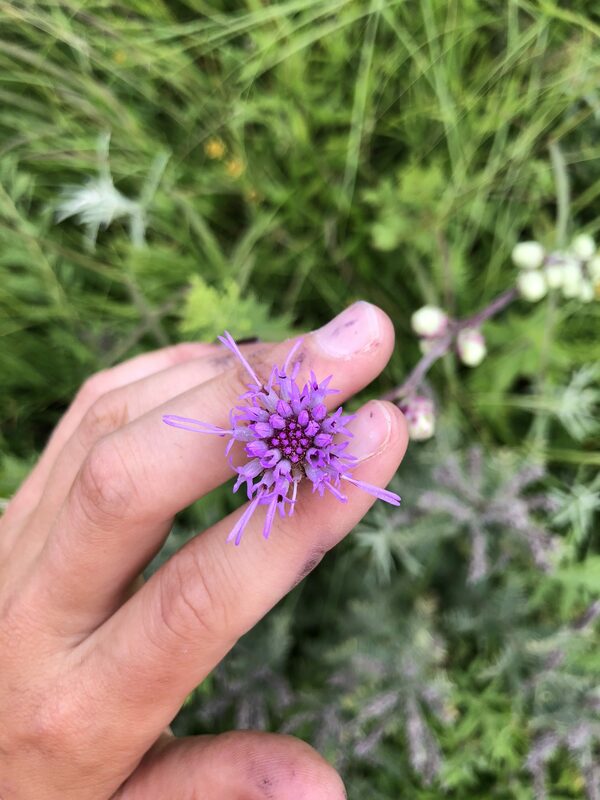 While Tris chose to analyze data from Michael’s Echinacea pollen limitation experiment, Julie and I decided to delve into the worlds of Liatris aspera and Solidago speciosa, two other Asteraceae common to prairie ecosystems. Lea has been working with these species for her PhD project over the past few years, studying how timing and location of flowering influences reproductive success, so she was a great help as we commenced our analysis! After having meticulously cleaned, counted, and classified innumerable Solidago and Liatris flowering heads, Julie and I wondered how the vast differences in head count between these two species may impact each plant’s fecundity (when Liatris plants generally have 10-20 heads, and many Solidago plants have hundreds or even thousands) . Further, knowing that human populations have largely suppressed the occurrence of natural fires in today’s prairies, we were also interested in analyzing the effects of prescribed burns on these common prairie species. 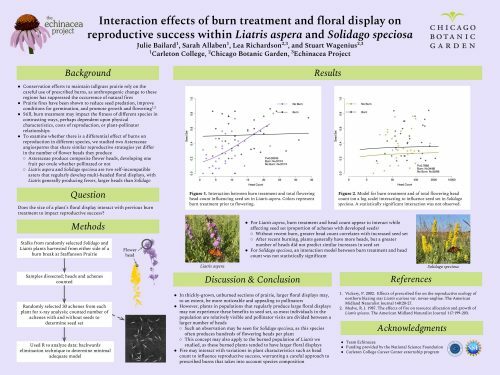 We put these two questions together in our data analysis by forming a statistical interaction model–one in which the effect of fire would interact with the effect of flowering head count to influence reproductive success–and fitting it to our Liatris and Solidago data. Interestingly, we did not uncover the same results for these two closely-related plants! For Liatris, the interaction model was highly supported by our data: the head count of plants seemed to have more effect on seed set (a measure of fecundity) in plants that had not been recently burned than in plants that had been recently burned. Yet, for Solidago, this pattern was not present. Our findings suggest that prairie management strategies, of which prescribed burns are an integral part, should carefully consider the species composition of a prairie before burning, because different species may react to burn treatment in different ways. Check out our poster, attached here, for a more detailed analysis, as well as plots of our models! Before I sign off, I want to send a huge ‘thank you’ to every member of Team Echinacea! This opportunity was incredibly influential for me–this was my first real research experience, and I learned so much about ecology, networking, career paths, data collection, statistics, and more. I had an amazing time, and I hope to see some team members again someday! Flowering Solidago speciosa at Staffanson Prairie Preserve. 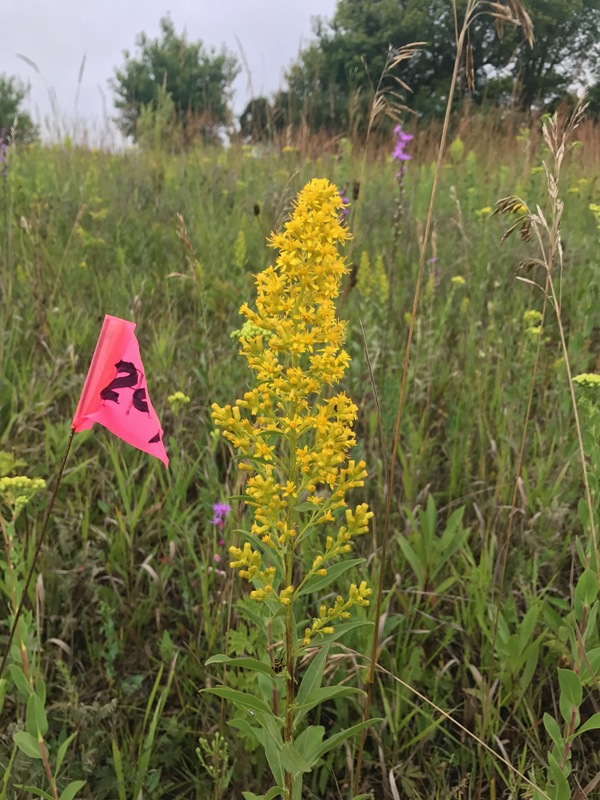 In the summer or 2017, Lea repeated her observational study quantifying flowering phenology and reproductive success (seedset) for Liatris aspera and Solidago speciosa plants located along a transect at Staffanson Prairie Preserve. Staffanson is divided into east and west units. The west unit of Staffanson was burned Spring 2016. In 2016, Lea looked for differences in phenology and reproduction of east vs. west Liatris and Solidago plants. In 2017, neither unit was burned. Data collected this year combined with data collected in 2016 will enable us to to see if burns influence phenology or reproduction. To assess phenology, Lea visited plants three times a week and recorded if they were flowering. She took GPS data for each plant included in the study. To assess reproduction (seedset), plants were harvested and brought back to the Chicago Botanic Garden so that seeds could be removed from the plant and x-rayed. This study helps us understand how fire, phenology, and reproduction are linked in species that are related to Echinacea angustifolia. Data collected: Phenology data was taken on the visors every Monday, Wednesday, and Friday through the growing season. Paper harvest data sheets were used and will remain in Minnesota until the final harvest of the season. GPS points shot: ~140 new GPS points were shot, one for each plant monitored in summer 2017 and ~180 points were staked to revisit plants that flowered last year. For each point staked, the plant status was recorded as either basal, flowering, or not present.